After the project, clean up tips! I wanted to take some time today to share a few clean up tips with you. After making projects in your kitchen all day – it’s inevitable. The clean up. BUT there is beeswax everywhere and oils are dripping all over and…. and…. this is when I want to give up and order take out. So below you’ll find a few time saving tricks that I use to get things cleaned up a bit faster (and easier) so I can get on with making the next meal. After all, someone is always hungry in my house! After I complete my project, I get out plain paper towels and wipe out as much of the residue that I can. Sometimes it’s been long enough that the wax has hardened so this can be a challenge. I have a set of little plastic scrapers that I use on my stoneware, I find them useful here as well. A plastic knife would also be great, if you didn’t have those scrapers. Use the scraper or blunt side of the knife to remove the largest portion of beeswax/product. Once you’ve done that, run your tap water to the hottest it can be, and fill your container. Allow to sit for a few minutes to soften, then dump out the water. Now, use a wad of paper towels to wipe away more of the residue. If you’re still having trouble, sprinkle a bit of baking soda on the softened beeswax/product to provide some “grip” and wipe again with a wad of paper towels. If you’d rather not use boiling water to clean up your beeswax, you can consider placing your cooled glassware into the freezer, once “frozen” the wax becomes brittle and is easier to break off the glassware. Once again, use a plastic butter knife to scrape off the beeswax left on the glass. Finally, we visited an issue that you may have occur when creating your special project. It doesn’t happen often, but inevitably a spill or accident will occur. Be prepared and know how you’ll handle this before it occurs. 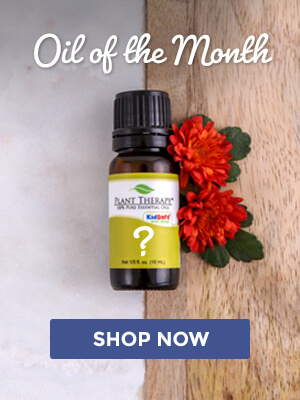 You can learn more in our blog post “Essential Oil Emergency! Now what?” This ensures you are always safe and ready for anything! As always, we want to hear from you! 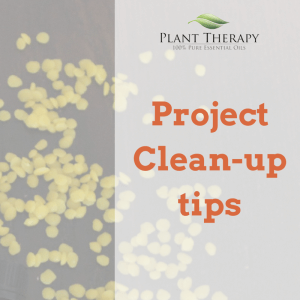 Do you have a project clean-up tip to share? 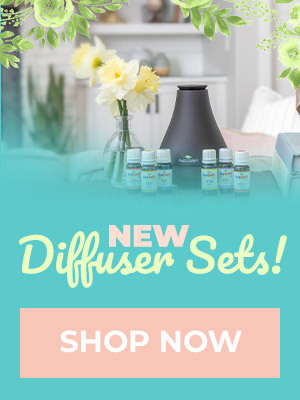 Leave us a comment here to share with others! OR contact us by emailing [email protected] for any questions, concerns or comments you may have. 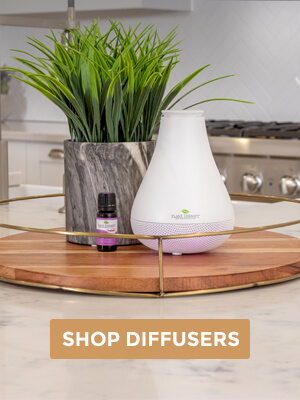 You can join our Facebook group Safe Essential Oil Recipes and participate in lively conversation with other essential oils users. We have your safety in mind – so come hang out with us to learn even more! We look forward to seeing you there! I use a silicone spatula to remove the maximum amount of residue before washing with hot water and eco friendly dish soap… but I will have to try the freezer trick because I use that when I’m cleaning out old candle jars and it works great! I use a Giant pyrex measuring cup for melting. Once I’m all done, I put it in the microwave on a pad of good paper towels (like Viva) and nuke until any residue has melted. I take it out and use that pad of paper towels to wipe off as much beeswax as I can. Then I do the Dawn and hot water thing. I also put the tube of my baster in the pyrex to melt out any wax from the tube. (I use the baster to fill my containers.) Since I don’t use them for anything else, I store them in a plastic bag. Just in case. I always use a paper towel to wipe out anything that had beeswax in it right away so I don’t have that problem. Saves a lot of time & frustration! How do you clean glass? I’ve been using rubbing alcohol. I’ve been hearing that dawn dish soap and hot water are the way to go. We have had a flood of fabulous cleaning tips and would love to have you share yours as well! I use dawn soap then put the hot water from the pot into the container that I melted the beeswax in. Wait a couple minutes and wash it away!!! Easy peasey!!!! Awesome tip! Thank you so much for sharing! The cleanup is certainly the worst part of my beeswax projects!